If you are waiting for the Raspberry Pi. And who isn't? You might like to indulge yourself in one of these wonderful devices. I saw one at Hack to the Future in Preston. The board is sold in kit form for around 20 GBP (about 30 USD). The FIGNition is the single-board-computer that has the kind of economy of design worthy of Sir Clive Sinclair. 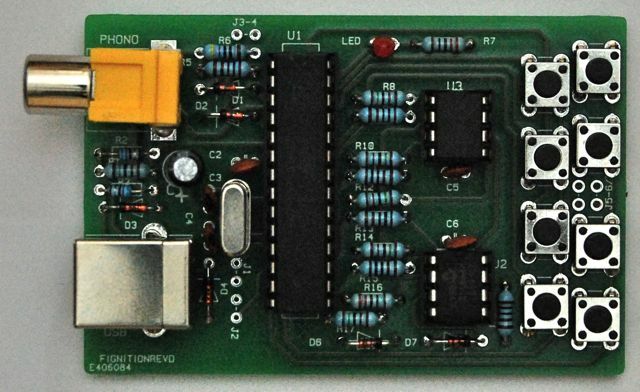 At its heart is an ATMega168 which manages to be a software graphics card, as well as a soft USB interface (for firmware upgrades). The yellow connector is composite video out and the connector below is USB that provides power. The two 8 pin ICs are Flash storage (384K) and RAM (8k). The keyboard (8 keys) uses a novel approach to allow you to enter commands to the computer. It takes a bit of getting used to, but is useable. The board boots into a FORTH interpreter. Forth is a stack-based language, which in keeping with the whole philosophy of this board is simple and elegant. The board is sold as a kit. The instructions are clear and easy to follow, and add to the fun of this project. 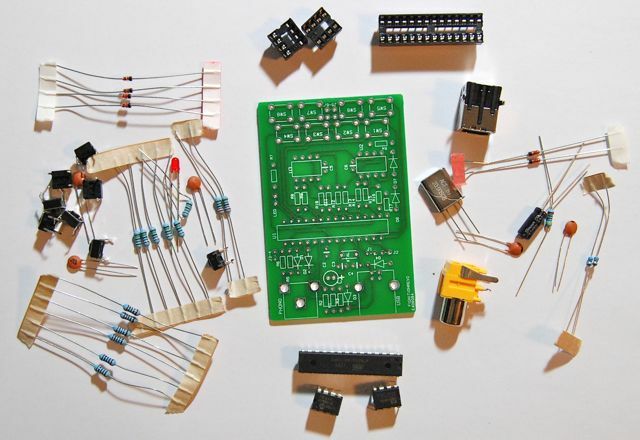 Everything is through hole, with well spaced and large pads, making is suitable for a newcomer to soldering. There are comprehensive instructions for testing it after construction, something that I was not patient enough to do. The board started up first time for me. You will need a TV that takes a composite video (yellow wire). I'm in the UK and our standard for TV is PAL, however the website does say that it will also work with NTSC. 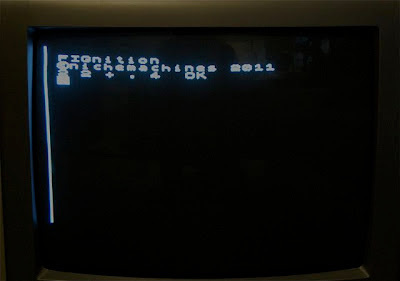 The website recommends the use of an old fashioned CRT style TV (above). 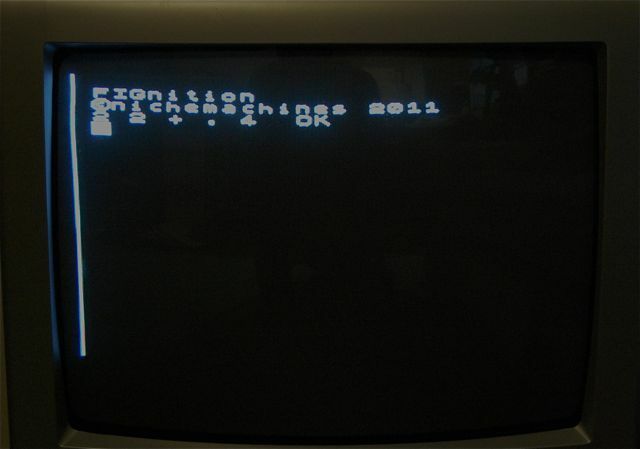 This worked fine, more stable than the old ZX81 I have, with clearer text. 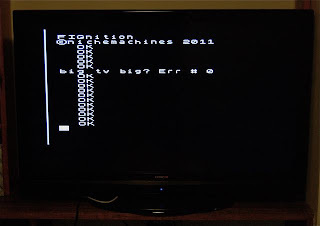 I also tried it on a modern 40" LCD TV (below). This rendered the text far more clearly, but every few seconds it would lose sync and flicker off until it synced again. But even so, just about usable. This product appealed to me on a nostalgia trip, and I thoroughly enjoyed making it. I will at some point revisit Forth and try out a few little programs. 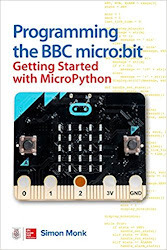 It is also a great educational tool, both as a construction project, but also to show those kids, just how little you need to make a computer and that life without a GHz processor and a G of RAM is possible. This is a K not a G computer. As a practical computer, then no, its not going to replace my laptop, and as a basis for embedded electronics, its not going to oust my Arduino or IOIO. But thats not what its for and I can not think of many more fun ways to spend $30! Before I purchased and built my FIGnition, I never made a programme in my life more than ten lines! I found forth at first mysterious but now think its better than learning BASIC.